I guess I’m one of those types who would rather clean than cook? But, I’ve been warned that if I don’t get my shopping done this week, all the special Kosher for Passover products (you know, the ones that actually DO need a special KLP hechsher) will be sold out. So, with fear as my motivator, I sat myself down this morning to make a menu plan. I also went ahead and made my grocery list for tomorrow; with any lucky, I’ll outrun those empty shelves. ** Note: We are eating out for one of the seders, and the other seder is just the five of us, plus my mom. My plan also reflects my tendency to serve simple meals – one main course, two side dishes, one dessert. I don’t even always make a “starter” – the shanda. I realize not everyone will go for this kind of “simplified menu plan”, but if you’ve been wanting an excuse to make your life ever so slightly easier, take a look at our plans. Lunch/Dinner: We’re going on an overnight trip with the kids. I’m not 100% sure how the food will work – but I am thinking I’ll pack our cooler chest with cream cheese, sliced cheese, avocados, hard boiled eggs, fruits and veggies. Perhaps for dinner, I’ll bring deli meat. Breakfast: Hard boiled eggs, cut-up fruit (I’ll bring a Tupperware filled with cut-up fruit in our cooler chest). Dinner: Gazpacho, grilled chicken breasts (marinated in lemon and garlic), roasted potatoes, red cabbage salad, Israeli salad, roasted eggplant salad. Flourless chocolate cookies and/or Miracle Cookie Bars for dessert. Dinner: Unstuffed cabbage (made on the stove top, not in the crockpot), mashed cauliflower made with coconut oil instead of margarine, steamed broccoli. Matzah “crack” for dessert. Lunch: Chicken schnitzel “fingers” (to use up any remaining matzah meal) + whatever sides I have left-over. If need be I’ll roast up some potatoes ahead of time. Left-over cookies and crack for dessert. Dinner/Seudah Shlishit: Left-overs? Whatever I scrounge out of my fridge? Snacks: I’ll make sure to have plenty of fruits, veggies and nuts on hand. I do have all that Bisli from Amazon. (I know – many of you had your order cancelled. I’m sorry.) The truth is that we actually eat pretty healthy during Passover. Picky eaters: My boys thankfully are very adventuresome eaters – and rarely if ever say “no” to something I’ve made. My daughter didn’t get those genes, unfortunately, so for her, I’ll make sure that we have all the fixings for matzah pizza on-hand, and plenty of hard-boiled eggs. She is also a big fan of fruits and some raw veggies. Tell me, what’s on your plan for meals this Pesach?! Looking for more menu planning inspiration? Check out these posts from year’s past. 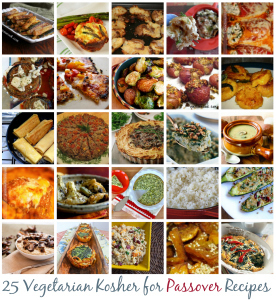 What’s on your Passover menu? Any traditional favorites that make the list year in and year out? Please share below – I know we all need more inspiration! Passover’s fun as a vegan, but I make a killer vegan lasagna. I make my own tomato sauce from scratch with garlic and fresh basil, and I make an almond ricotta. For that, I either buy KLP almond meal or grind whole almonds to almost a flour in my KLP Vitamix canister. I add salt, fresh chopped parsley and basil, and just enough water to get it to a spreadable consistency. First layer is sauce, next layer is whole wheat matzoh, and the one after that is ricotta. Wash, rinse, repeat. Bake it at 375 for 25 minute or until matzoh is soft. You’ll thank me later. A lady after my own heart. The simpler the better. I also do 1 main, 2 sides or a side and a salad, plus desserts. I usually bake a few desserts on Thursday or Friday morning and they last through the week. It is, however true about the KLP stuff. I have started picking up things here and there only because some were on sale last week, and I have noticed that the KLP shelves are getting ‘bold spots’. Thanks a million, Mara. Best wishes to you and your family. Okay, I’m definitely going to shop tomorrow! Thanks for the warning. Simple meals rock! Stefanie, I just saved your lasagna recipe. I’ll thank you now. We are small this year -only fourteen (with a vegetarian and a wheat-allergic child). I have a menu for the Seder we are hosting. I have a schedule of what is to be done every day starting tomorrow. I have a timetable for the Seder – what has to be heated up and for how long. If I didn’t do all of this, we would not have a Seder! Shopping is completed except for fresh fruit, veggies and milk. We no longer live near my beloved Monsey, NY, so items do disappear if not purchased early. I now travel 45 min. to get to a Shoprite that has a very good Pesach selection. We eat leftovers for the two days after the Sederim. Then I start cooking again based on what we have around (as is my modus operandi for the rest of the year). Our Seder menu: gefilte fish; chicken soup with matzoh balls/cauliflower soup; tossed salad with homemade Russian, balsamic vinaigrette and Italian dressings; quinoa sweet potato and cranberry salad; hearts of palm and avocado salad; pulled brisket surrounded by broccoli; balsamic rub chicken; Mrs. Feingold’s Vegetable Casserole; potato kugel; garlic (we use garlic) smashed small red potatoes; carrot tzimmes; Harvard Beets (I’m devising a KforP version as my MIL talked about this being one of her favorites from childhood. This will be interesting as I am not good with anything beets); homemade gluten-free apple crumble; apple cake; apricot almond chocolate clusters; nuant nut candy; and charoset. Argh – why do I do this to myself??? Maybe I should save your column for next year and remind myself to simplify. And of course, I always try new recipes when we are having guests. May we all stay sane and enjoy our family and guests as they enjoy our labor of love.